Modern troubadour and guitar explorer Harvey Reid is posting in-depth writings on troubadour issues, guitar education and American music topics here. 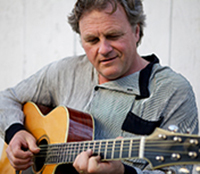 He has performed and taught guitar since 1974, was a former national Fingerpicking Guitar Champion, and has released 32 highly-acclaimed solo recordings of original, traditional, and contemporary acoustic music. He now lives in Southern Maine and is performing regularly and continuing work on a very ambitious series of stringed instrument educational books available from Amazon.com, other online retailers and from this web site. Some older articles, essays and writings can be found at this page. A couple of the most popular ones from the past have been re-listed here at the bottom. Other essays on learning guitar are posted on the Song Train web site. ASCAP & BMI: Shadowy Thieves or Guardians of Musical Property?